The Cliff House is a truly special location that is central to our spectacular coastline. Nearby are an array of stunning ocean beaches and sheltered waterways. For the active, the area is growing in reputation for some wonderful walking and hiking options at nearby Bream Head Scenic Reserve. Back at Cliff House, all modern conveniences are provided, including SKY TV and wifi and high-quality linens. A full, well-equipped kitchen and large BBQ will delight self-caterers. Guided kayak excursions, trips to the Poor Knights Marine reserve, day trip to the Bay of Islands or the giant Kauri trees of Waipoua Forest. 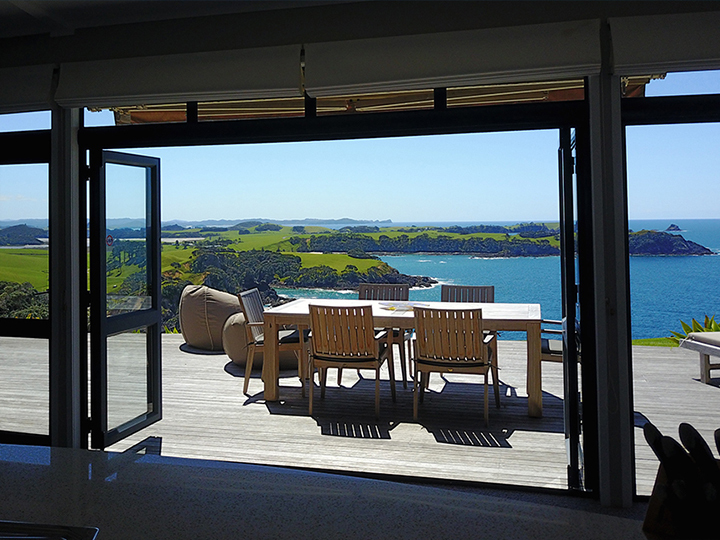 However, our own backyard is a natural playground of beaches, coves and clear water estuaries, the best of Northland. — Cliff House, where the sea meets the sky. Full catering by private Chef – please enquire.